Is fashion a never-ending cycle? Amid the current renewed craze for tiny ladies’ watches, Blancpain reinvents the enchanting design codes of the Ladybird in an ultra-thin contemporary version. First unveiled in 1956, this watch was equipped at the time with the smallest round movement on the market. Sixty years later, its slim white gold case highlighted by diamonds remains a supremely elegant and refined embodiment of Blancpain’s technical expertise. Beating secretly beneath the glowing exterior of the watch is a tiny automatic movement equipped with a silicon balance-spring – a mechanical feat that punctuates each passing moment with a blend of delicacy and precision. On the dial graced with interlacing mother-of-pearl foliage, time glows with a luminous charm that literally captures the gaze. 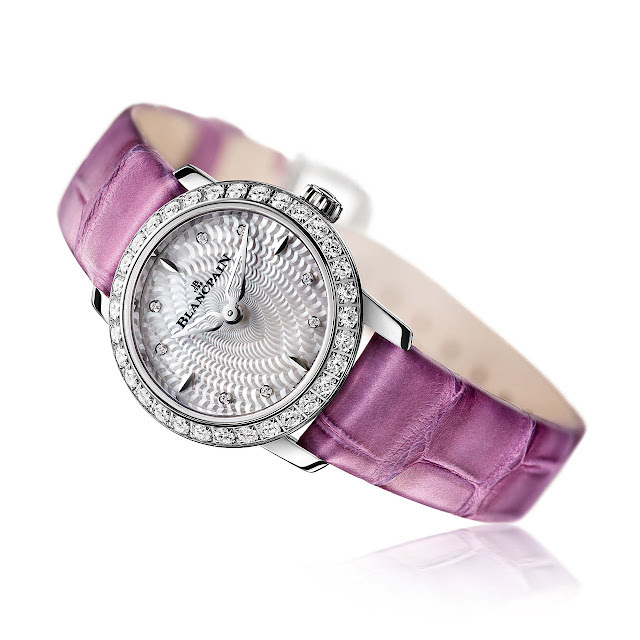 A delightfully retro-chic look of which Blancpain gives a stylish new interpretation in this 60-piece limited edition. Mechanical automatic, 6150 calibre, 180 components, 29 jewels, silicon balance-spring, 3.9 mm thick, 40-hour power reserve. 18K white gold, 21.5 mm. Bezel set with 32 diamonds (0.534 cts). Sapphire crystal and caseback. Water-resistant to 3 bar (30 m/100 ft). White mother-of-pearl dial. Hour-markers set with 8 diamonds (0.011 cts).